COLUMBUS DAY & FRANCIS BELLAMY: PLEDGE ALLEGIANCE TO SOCIALISM, NAZISM, FASCISM? When Bellamy wrote "liberty and justice for all" he meant the liberty to have government schools impose prayer and Bible reading and worship (which they did), and the justice of Christian Socialism that was Bellamy's dogma. Francis was a leader in the Society of Christian Socialists and that is the dogma that schools brainwashed into children as he advocated the government takeover of all schools. openly declared that he was in charge of the Pledge program and wrote the material. When Bellamy said later that his Pledge "....began as an intensive communing with salient points of our national history, from the Declaration of Independence onwards; with the makings of the Constitution...with the meaning of the Civil War; with the aspiration of the people..." he meant that his Christian Socialism dogma was one of the "salient points of our national history" and "the aspirations of the people." All of the above occurred during a time when (and this was known by Bellamy) government schools imposed particular forms of daily group-prayer and Bible-reading, soon to be supplemented by Bellamy's proposal for mechanical chanting to the flag. Francis Bellamy is not known to have ever objected to such practices. An objection would not have been consistent with his personal beliefs, and with his general attitude favoring government schools and indoctrination. 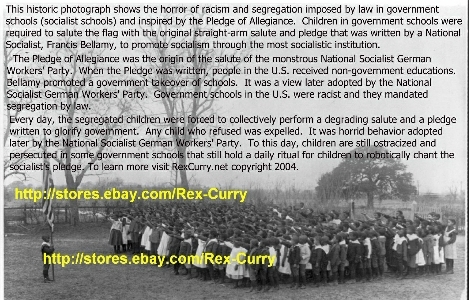 When RexCurry.net first provided the entire "Pledge of Allegiance Program" on the web at http://rexcurry.net/pledgespeech.html a web search at that time showed that RexCurry.net was the only source on the internet for Bellamy’s scary speech/program. That fact exposes the intellectual dishonesty of the media at that time, in that the media covered the issue of the phrase "under God" in the Pledge of Allegiance as a hot topic due to court litigation, yet the media never discussed the original Pledge program, never researched it, and never provided the program to the public to allow them to view it themselves. That fact exposes the intellectual dishonesty of the media to this day, in that the media continue to cover the issue of the phrase "under God" in the Pledge of Allegiance, yet the media will not mention the original Pledge program, will not research it, and never provide the program to the public in articles about "under God" in the pledge. Columbus Day http://rexcurry.net/francis%20bellamy.jpg Francis Bellamy. Some people want to abolish Columbus Day. It would make as much sense (or more) to abolish the Pledge Of Allegiance, and to repeal all Pledge laws. "The meaning of the four centuries." All of the above occurred during a time when (and this was known by Bellamy) government schools imposed particular forms of daily group-prayer and Bible-reading, soon to be compounded by Bellamy's mechanical chanting to the flag. Francis Bellamy is not known to have ever objected to such practices. An objection would not have been in consistent with his personal beliefs, and hi general attitude about government schools and indoctrination. At that time, government schools also imposed segregation by law and taught racism as official policy. Francis Bellamy is not known to have objected to those practices either. Modern support for the Pledge exists only because the media and government schools suppress the true intent behind the Pledge, and Bellamy's speech, and his terrifying ideas. "The Meaning of the Four Centuries" shows that Bellamy viewed the pledge of allegiance and government schools as a way to promote his totalitarian socialism. 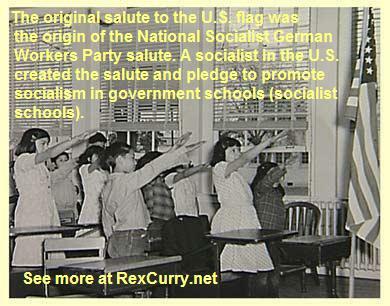 The Pledge of Allegiance was written so that children would place the imprimatur of nationalism, the U.S. flag, in government schools and pledge allegiance to Bellamy's totalitarian national socialism. The spectacle America presents this day is without precedent in history. From ocean to ocean, in city, village, and country-side, the children of the States are marshaled and marching under the banner of the nation : and with them the people are gathering around the schoolhouse. Men are recognizing to-day the most impressive anniversary since Rome celebrated her thousandth year -- the 400th anniversary of the stepping of a hemisphere into the world's life; four completed centuries of a new social order; the celebration of liberty and enlightenment organized into a civilization. In his Columbus Day address, Bellamy shows the modern use of the word "schoolhouse" as a hackneyed and inaccurate synonym for "government schoolhouse" as Bellamy promotes a socialist monopoly for education. At that time (1892) government was taking over education. In "the children of the States are marshaled and marching" Bellamy foreshadows his desire for government schools to be indoctrination centers for the "Industrial Army" (a Bellamy phrase) explicitly modeled on the military and described in the totalitarian socialist novel Looking Backward by Edward Bellamy, his cousin and cohort. That is also what Bellamy means by the phrase "new social order." And while, during these hours, the Federal government of these United States strikes the keynote of this great American day that gives honor to the common American institution which unites us all, -- we assemble here that we, too, may exalt the free school that embodies the American principle of universal enlightenment and equality : the most characteristic product of the four centuries of American life. Bellamy uses the absurd modern cliche "free school," implying that government schools are "free," instead of being outrageously expensive compared with the many better alternatives, and hiding the fact that payments are forced via taxation/theft. It explains why so many government-school students are ignoramuses about economics and why they are socialists. He imagines that over-priced socialized schools provide "enlightenment" even though every country that most closely paralleled the totalitarian socialism of Looking Backward was unenlightened (the Union of Soviet Socialist Republics, 62 million killed; the Peoples' Republic of China, 35 million killed; and the National Socialist German Workers' Party, 21 million killed). (see http://rexcurry.net/socialists.html ). Four hundred years ago this morning the Pinta's gun broke the silence, and announced the discovery of this hemisphere. Bellamy makes poor efforts to tie in the Columbus Day celebration, which was, of course, the excuse he was given to expound on his totalitarian socialist ideas. It was a virgin world. Human life hitherto upon it had been without significance. In the Old World for thousands of years civilized men had been trying experiments in social order. They had been found wanting. But here was an untouched soil that lay ready for a new experiment in civilization. All things were ready. New forces had come to light, full of overturning power in the Old World. In the New World they were to work together with a mighty harmony. Bellamy shows his contempt for individual liberty with the phrase "experiments in social order." To Bellamy, no one has a right to personal or economic freedom, and everyone is simply part of an "experiment in social order," especially the totalitarian socialist experiment that Bellamy likes in Looking Backward. It was for Columbus, propelled by this fresh life, to reveal the land where these new forces were to be given space for development, and where the awaited trial of the new civilization was to be made. To-day we reach our most memorable milestone. We look backward and we look forward. The phrase "We look backward and we look forward" is a blatant reference to the totalitarian socialist novel Looking Backward by Edward Bellamy, the cousin of Francis Bellamy. In it, society has become one giant socialist monopoly. Men are treated as military draftees, from the age of twenty-one until the age of forty-five, in society's industrial army (more at http://rexcurry.net/pledge_military.html). Bellamy's glorification of the military includes government assignment of all jobs. Everyone is issued ration cards which are used to draw goods from government storehouses. By force of government, no one may have any more than anyone else. The entire education system is only a government-school system and it creates the industrial army and the entire socialist monopoly system. Edward Bellamy portrayed it as utopia. Backward, we see the first mustering of modern ideas; their long conflict with Old World theories, which were also transported hither. We see stalwart men and brave women, one moment on the shore, then disappearing in dim forests. We hear the axe. We see the flame of burning cabins and hear the cry of the savage. We see the never-ceasing wagon trains always toiling westward. We behold log cabins becoming villages, then cities. We watch the growth of institutions out of little beginnings -- schools becoming an educational system; meeting-houses lending into organic Christianity; town-meetings growing to political movements; county discussions developing federal governments. Bellamy refers to Native-Americans as "savages" because Bellamy was another bigot socialist. As editor of the magazine The Illustrated American , he wrote editorials denouncing southern European immigrants. "A democracy like ours cannot afford to throw itself open to the world," he wrote in 1897. "Where every man is a lawmaker, every dull-witted or fanatical immigrant admitted to our citizenship is a bane to the commonwealth. Where all classes of society merge insensibly into one another every alien immigrant of inferior race may bring corruption to the stock." See http://rexcurry.net/pledgebigot.html. He promotes the socialist monopoly educational system using religion. We see hardy men with intense convictions, grappling, struggling, often amid battle smoke, and some idea characteristic of the New World always triumphing. We see settlements knitting together into a tuition with singleness of purpose. We note the birth of the modern system of industry and commerce, and its striking forth into undreamed-of wealth, making the millions members one of another as sentiment could never bind. And under it all, and through it all, we fasten on certain principles ever operating and regnant -- the leadership of manhood; equal rights for every soul; universal enlightenment as the source of progress. These last are the principles that have shaped America; these principles are the true Americanism. Bellamy uses the word "Americanism" for "Nationalism," his totalitarian socialism. Bellamy uses the word "Americanism" to turn it on its head and to avoid ever extolling individual liberty, private trade, and cutting the size and scope of government, as Washington and Jefferson taught. Those libertarian concepts are destroyed in Looking Backward also. "We look forward. We are conscious we are in a period of transition. Ideas in education, in political economy, in social science are undergoing revisions. There is a large uncertainty about the outcome. But faith in the underlying principles of Americanism and in God's destiny for the Republic makes a firm ground of hope. The coming century promises to be more than ever the age of the people; an age that shall develop a greater care for the rights of the weak, and make a more solid provision for the development of each individual by the education that meets his need. Here is another reference to the book "Looking Backward." There are also more religious references which tie into Bellamy's Society of Christian Socialism and are relevant to modern controversies regarding the 1954 expansion of the Pledge of Allegiance. As no prophet among our fathers on the 300th anniversary of America could have pictured what the new century would do, so no man can this day reach out and grasp the hundred years upon which the nation is now entering. On thy victorious results of the completed centuries, the principles of Americanism will build our fifth century. Its material progress is beyond our inception, but we may be sure that in the social relations of men with men, the most triumphant gains are to be expected. America's fourth century has been glorious; America's fifth century must be made happy. "...no man can this day reach out and grasp the hundred years upon which the nation is now entering." If Bellamy had lived the next hundred years, he could have "looked backward" at atrocities in those countries that shared his ideas, including the Union of Soviet Socialist Republics (62 million killed), the Peoples' Republic of China (35 million killed) and the National Socialist German Workers' Party (21 million killed) (see http://rexcurry.net/socialists.html). The most triumphant gains were from capitalist countries that somehow managed to not follow Bellamy's path as far as other less fortunate places. Bellamy perverts the U.S. idea of equality before the law, and turns it into the monstrous idea of government making everyone the same (see http://rexcurry.net/equality.html) as in the totalitarian socialist novel Looking Backward. The perversion of "equality" is why socialists support government schools in their efforts to force sameness, and to make everyone equal in an "industrial army." We, therefore, on this anniversary of America present the Public School as the noblest expression of the principle of enlightenment which Columbus grasped by faith. We uplift the system of free and universal education as the master-force which, under God has been informing each of our generations with the peculiar truths of Americanism. America, therefore, gathers her sons around the schoolhouse to-day as the institution closest to the people, most characteristic of the people and fullest of hope for the people. This section led to the historic discovery by RexCurry.net that the phrase "under God," though not in the original Pledge, was used by Bellamy in this accompanying article promoting his totalitarian society of "Christian socialism." Bellamy repeats the misnomer "Public School" instead of "Government School" and repeats the absurd cliche that government schools are "free," and he does so in order to hide the fact that government schools are paid for with taxes that people are forced to pay whether they want to or not. On the contrary, all of the better alternatives to government schools are examples of true "public schools" that people voluntarily pay for and support, and that engage in true altruism for the needy, even providing educations that are truly "free" unlike government schools. Bellamy and socialists like him never operate their own "public schools" that are "free" because they use the terms as lies to trick people into supporting expensive government schools that are paid for with force. To-day America's fifth century begins. The world's twentieth century will soon be here. To the 13,000,000 now in the American schools the command of the coming years belongs. We, the youth of America, who to-day unite to march as one army under the sacred flag, understand our duty. We pledge ourselves that the flag shall not be stained; and that America shall mean equal opportunity and justice for every citizen, and brotherhood for the world. Bellamy's speech concludes with "We march as one army," another terrifying reference to the totalitarian socialist novel Looking Backward and Francis Bellamy's "Industrial Army" dutifully marching out of government schools. 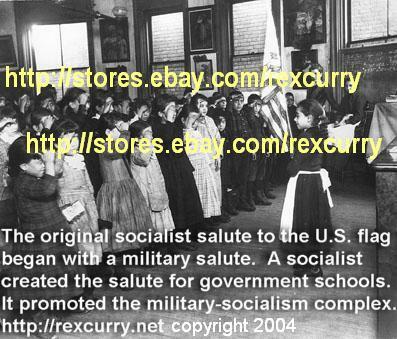 It explains why the original pledge of allegiance had a salute that began with a military salute (that extended during the pledge to a straight-arm salute) in keeping with the "Industrial Army" and the military-socialist complex. See http://rexcurry.net/pledge_military.html. The official ground breaking for the Columbian Exposition was planned for Columbus Day in 1892, the day around which James Upham of the Youth's Companion organized the Public School Celebration to include the placement of flags in government schools and the promotion of the Pledge of Allegiance. James Gilbert states: The Chicago Fair linked the utopian speculations of the late nineteenth century, particularly as expressed by Edward Bellamy (cousin to Francis Bellamy) and William Dean Howells, to the City Beautiful movement of the first decade of the twentieth century which redesigned cities following the the layout of the Fair (256). The layout of the fair was called the great "white city." Gilbert observes that the project allowed the architects to create, “bridges between utopian planning and notions of the perfected city and the actual plans of urban architects, road-builders and transportation designers” (256). The exhibition’s designs laid the groundwork for the subsequent “House Beautiful” movement in American architecture. The architectural choices were condemned by some critics, including one of the designers involved; Louis Sullivan later predicted, “the damage wrought by the World's Fair will last for half a century from its date, if not longer” (Chicago Historical Society). There are ominous parallels to later plans under the National Socialist German Workers Party, the Union of Soviet Socialist Republics, and the People's Republic of China. Altogether, 46 nations presented 250,000 displays. It was intended to commemorate the 400th anniversary of Columbus’ discovery of the New World. The fair was an enormous undertaking. It lasted six months. It was constructed on reclaimed swampland, bordering Lake Michigan. The fair included the first-ever Ferris wheel. It stood 250 feet tall and rotated 36 cars, each able to hold up to 60 people. Chicago won out over proposals from New York City, Washington, DC, and St. Louis for the privilege of hosting. When the World’s Columbian Exposition opened on May 1, 1893, the Chicago was just 60 years old. It was the last world’s fair of the 19th century. Today the only building from the "white city" (as it was called) still standing is the old palace of fine arts. It's since been converted into the city of Chicago's Museum of Science. What happened to all the other buildings? After the Exposition officially closed, there was a big railway strike in the city of Chicago, and in the ensuing rioting, most of the 'white city' went up in flames. Whatever did not burn to the ground was demolished. The land was leveled. Later, the area was used for various purposes - first athletic fields, then a U.S. Army missile range, and then for a long period of time it was just a big flat reclaimed swampland with weeds. Now the reclaimed swampland is called a "nature preserve." Within only a couple of generations, the Columbian Exposition slid into the dustbin of history. Jean-Jacques Rousseau wrote about the "civil religion" that inspired the French Revolution and the socialist Wholecaust (of which the Holocaust was a part): the former Union of Soviet Socialist Republics, ~60 million deaths; People's Republic of China, ~50 million deaths; National Socialist German Worker’s Party, ~20 million deaths. In the 1920's Bellamy devised "A Plan for a Counterattack on the Nation's Internal Foes: How to Mobilize the Masses to Support Primary American Doctrines." Use caution re the poster Percivale. He is not a "Dr." and his website reveals no knowledge that he has about the topic being discussed. His website is about a fantasy role-playing game in which he dresses in costumes. Percivale lists himself as a "formerly an ordained wiccan priest" along with other bizarre comments of his own. Unlike, Dr. Curry, Percivale has no credentials as a historian. Yet, any actual dispute he has about Dr. Rex Curry's work is mysteriously lacking. Percivale has something of a terrible reputation for self-promotion and disreputable scholarship in that he does not actually dispute any of Dr. Rex Curry's work. Percivale just uses insults and evasion. Percivale shows his disreputable scholarship when he names as a source an anonymous bulletin board (wikipedia) where people deliberately delete the truth and where they post, repost and maintain lies and myths that they like. Percivale also lies about wikipedia in that Dr. Curry's work is some of the most referenced historical work on wikipedia (people often use it without attribution in apparent attempts to boost their own credibility). I also think that it is interesting that ex-wiccan priest Percivale concedes that Dr. Curry is correct to have used the term "evidently" in the statement that "The first publication of the Pledge of Allegiance preceded the article below in "The Youth's Companion" of September 8, 1892, evidently written by Francis Bellamy, the author of the Pledge of Allegiance." Percivale embarrasses himself by saying "Its really not very likely that Bellamy wrote this article. I think that it is more likely that it was written by James Bailey Upham or one of his editorial staff." Percivale does not realize that is a similar same argument was made about the Pledge itself (the argument that James Upham wrote the Pledge). Percivale does not realize that Bellamy was "one of his editorial staff" and specifically assigned to handle the Pledge and the program. Bellamy openly declared that he was in charge of the Pledge program and wrote the material. Bellamy is the only one listed at the end of the Youth's Companion article, and listed as "Chairman, Executive Committee" of the Superintendants of Education in charge of the project. Aside from that, Upham and Bellamy worked together, liked each other, and shared the same beliefs. The best that Percivale can do is cite hearsay from Sally Wright, Bellamy's great-granddaughter,who did not even actually know Francis Bellamy, the person she is wrote about. Wright is simply repeating a myth. Bellamy was chased from the pulpit for sermons on the topic "Jesus the Socialist." Percivale accidentally concedes that Dr. Curry's work is correct when Percivale writes "He even opposed parochial schools on the grounds that the state should educate its children." Bellamy opposed parochial schools for the same reason Bellamy opposed ALL NON-GOVERNMENT SCHOOLS, on the grounds that the state should educate all children. Bellamy was a totalitarian socialist and wanted the government to take over education and end all other alternatives. Bellamy was a regular churchgoer. And he voted both Democratic and Republican because he was a socialist and would vote for whoever he thought promoted socialism the most. It is clear that Wright is expressing her own opinion when she says " I believe that my great-grandfather got it right," she added. "A Pledge of Allegiance that does not include God invites the participation of more Americans." Today, the entire Pledge program could not be performed in a government school because of its religiousness. The only thing left in litigation are the two word in the Pledge itself, added in 1954 when it was becoming clear that the entire pledge program could no longer be performed, and while the other habits of Bellamy's time, daily praying and bible reading in government schools, were no longer able to be performed (or near so). Percivale also references Dr. Curry's discovery that the phrase "under God" though not in the original Pledge, was in the original Pledge Program, along with various other religious references. Again, all Percivale can do is cite hearsay from people who did not actually know the man, such as Bellamy's great-grandson. And that quote supports Dr. Curry's work: "There's a little irony in the fact that his profession was a Baptist minister," says Francis Bellamy's great-grandson, 50-year-old Scott Bellamy, who runs a restaurant outside Memphis, Tenn. "You'd think immediately he would not have had bad feelings about having `under God' in the pledge. But he was not even happy about them adding `to the United States of America.' "
Percivale is conceding exactly what Dr. Curry has said on the site that archives Dr. Curry's work. The Pledge program was replete with religious references, including "under God." Francis was long dead in 1954 when "under God" was added to the Pledge part. The only thing that irritated Bellamy that he did not like it when other people changed his Pledge. Again, Percivale can only quote hearsay from elderly relatives talking about things written by an elderly Francis Bellamy, late in his life, and yet that information supports Dr. Curry's work. "He thought (the changes) spoiled the poetry of it," John Bellamy said. Yes, it spoiled the poetry of it, the beat. That is correct. It did. That concedes that Dr. Curry's work is correct. Based on Mr. Bellamy's own explanation of his train of thought when he wrote the pledge, which would seem to completely support the suggestions of Dr. Curry, it is clear that Percivale is a source that can be easily discounted. Percivale concedes that was an excellent hatchet job against Percivale after Percivale of course started with the insults and attacks. It was also, fortunately, completely responsive to every weak comment that Percivale actually attempted. For example, Percivale concedes that he is not a doctor. Dr. Curry is a doctor. Percivale does not dispute that. Percivale concedes that he has no credentials. Dr. Curry does. Percivale concedes that he is not a a historian and does not have any knowledge concerning the history of this topic especially. Dr. Curry is and does. Unlike Dr. Curry, whenever percivale attempts to make a "historical" statement, Percivale is sure to inaccurately reference the material in question. Dr. Curry on the other hand turns to the normal sorts of sources that most credible historians use...primary sources when available, and secondary sources when not. Percivale uses pretty sad ad hominem and then is upset when reciprocation occurs. At least give us something good if you're going to attempt personal attacks Percivale. Honestly, your interpretation of my post is possible the most disingenuous spin on a comment that I have ever witnessed. One rarely sees such a pure attempt at using personal attacks as a means of distracting from the lack of intellectual depth behind the attacker's position. And you make it so easy to mock you. Your pointless comments actually do acquire a point (and humor) when they are repeated back to you to mock you. Percivale has no relevant website, no fan mail page (as Dr. Curry does) and no close followers. It is no wonder. Percivale continues to misrepresent. Contrary to Percivale's wish, it is relevant to the topic that Francis Bellamy was a Baptist Minister. All Percivale can do is state that was a position that Mr. Bellamy abandoned, when the reality is that he was pushed from the pulpit by others for sermons on topics like "Jesus the Socialist" and Bellamy pursued the same dogma, just no longer as a baptist minister where he had been rejected. Bellamy's original Pledge program is replete with religious references. (And because the program used Columbus as its premise, it can be thought of as Bellamy's version of "Columbus the Socialist"). That all shows the remarkable depth of Percivale's attempts to mislead. Percivale says "having left the church entirely later in his life because of the racism that he felt pervaded the christian sects of his day. In fact, he spent the later years of his life completely estranged from any sort of religious worship." Of course Percivale provides no support because there is none. Bellamy left one particular church and the story goes that it was because of racism (not because he rejected religion). On top of it all, that was late in his life (long after his Pledge mess), a life in which Bellamy's desire to have government take over all schools had resulted in government schools that imposed segregation by law and that taught racism as official policy. It is interesting to note that the late-in-life church story contains no remark by Bellamy about that practice in Bellamy's government schools. Of course, it is hoped that Bellamy would have felt remorse for what he had wrought via government school socialism. Here, this will make it simple for Percivale. 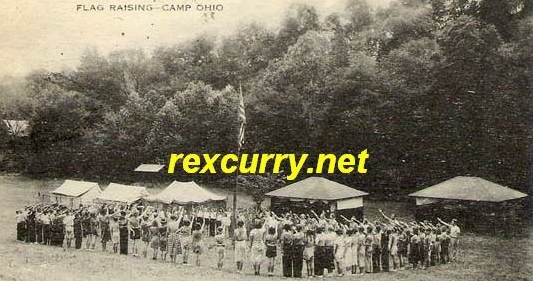 Can you provide us a link to any independantly credible historical source (which does not include, obvously, your own ramblings) that disputes the many photographs of the early Pledge of Allegiance on the website that archives the work of Dr. Rex Curry? You don't dispute the actual photographs do you? Can you provide us a link to any independantly credible historical source (which does not include, obvously, your own ramblings) that disputes the points stated in the previous post about the original Pledge program article, or can you even show us that article if you claim that it states something else? Can you also please provide us with a list of your PhD's, along with a list of the institutions from which you obtained them, or (as on the site that archives Dr. Curry's work) a fan mail page and another page filled with references to media (about your claims)? There is no need to respond because those are all rhetorical question to which everyone knows your answer: NO. Every morning America unleashes a sinister alter ego. Things that were unimaginable become inevitable and mandatory. You have been sold a lie.